Featured: Welcome to Riverside Neighbourhood: Dirty Pawz Dog Wash; Window Wonderland Contest is BACK!! BIA Notices/Reminders: Shop the Neighbourhood & Light Up Riverside; Business Sidewalk Signs. Neighbourhood News: Ontario Energy Board Community Meetings; Annual Winter Tune-Up Program. Welcome to Riverside Neighbourhood: Dirty Pawz Dog Wash! Dog lovers, rejoice! Riverside neighbourhood just gets it first dog wash and it’s the perfect place to keep your dog clean – and happy! Dirty Pawz Dog Wash opened Sunday 11th, at 804 Queen St. E!It is an easy to use self-serve dog wash, it provides a safe & stress-free environment to bathe your dog without the mess at home. They also offer other services including treats, accessories and pet laundry. Some of their highlights include several payment options: coin, debit/credit tap and a PAUSE feature if you wish to use your own shampoo or need to stop the timer. Window Wonderland Contest is Back! The holiday season is fast approaching and the BIA is launching Riverside’s Window Wonderland contest again! 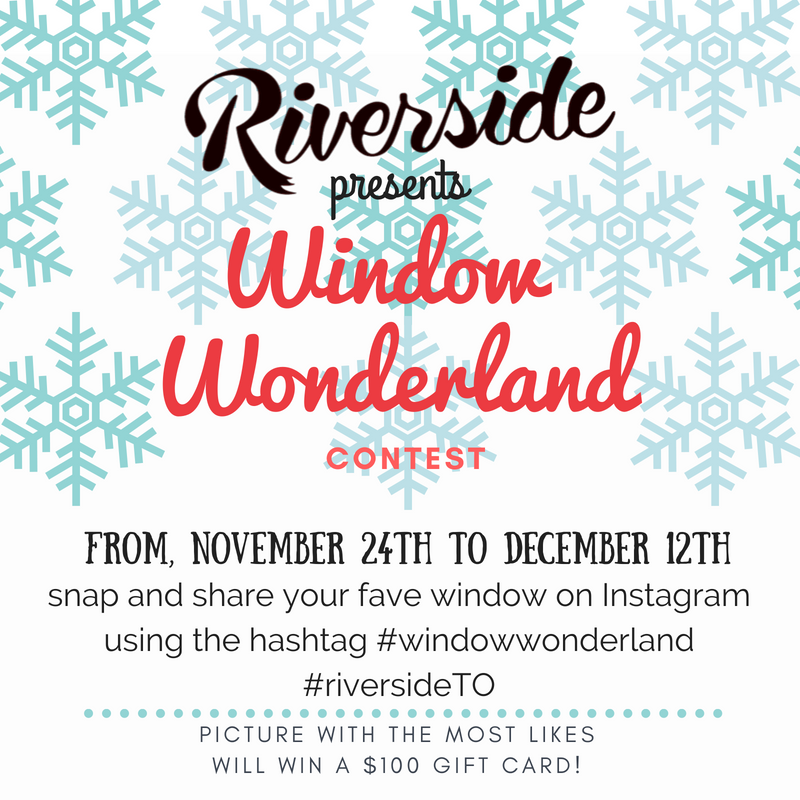 For those new to the contest, the BIA encourage you to dress up your windows for the Holiday Season and invite people to snap a picture and share it on Instagram with the hashtags: #Windowwonderland and #RiversideTO. The contest will run from Nov 24th to Dec 12th and the photo with the most “LIKE”s will get a $100 gift certificate from the BIA to use in the business of the photo + an Antler Breakfast ticket! Let us know here that you’ll be participating to help promote it! Light Up & Shop the Neighbourhood on Nov 24th! All Riverside businesses and organizations are invited to take part, Nov 24th from 12-6pm! Let’s us know what you’re doing!Don’t miss the chance to be part of a day of cheer! The BIA is inviting everyone for meet and greets, treats and special happenings to help ring in the holidays! There are so many options for you to welcome people inside your shop, it might be a chance to stay warm, to know the owners or maybe take a tour of your space! Please let us know what you’ll be doing by Nov 20th (marketing@riverside-to.com) to be part of neighbourhood-wide promotions. In the evening from 5-7pm is our annual tree lighting, Light Up Riverside, in the Mustard Seed Courtyard at 791 Queen Street East! There will be live music, crafts, photobooth, treats and more for everyone to enjoy. A BIG thank you to our 2017 Light Up Riverside Co-Sponsors, Baird MacGregor Insurance LP and Gillis & Kennedy RE/MAX. They are holding six community meetings throughout the city, beginning November 22. Dates, times and locations follow below, and each event linked for easy registration on Eventbrite. Want to make sure your bike is winter-ready? Switchback is looking forward to their Annual Winter Tune-Up Program, which helps you beat the spring rush and wait-times. Starting in late January, Switchback is offering the opportunity to have your bike(s) picked up at home, serviced, and returned to you, with pick-up and drop-off done at no extra cost.